Today, we were discussing the evolution of the Metric System. Mehak was extremely annoyed at the decision of the scientists at IUPAC to fix the length of 1 metre at its current length. She constantly asked me why they chose that particular length for the metre and not any other. I had no reason that I could explain within the limits of a 5th grade curriculum. The idea of explaining the distance light travels or the idea of cycles of an excited Caesium ion did cross my mind and I was contemplating explaining it but saner heads prevailed. 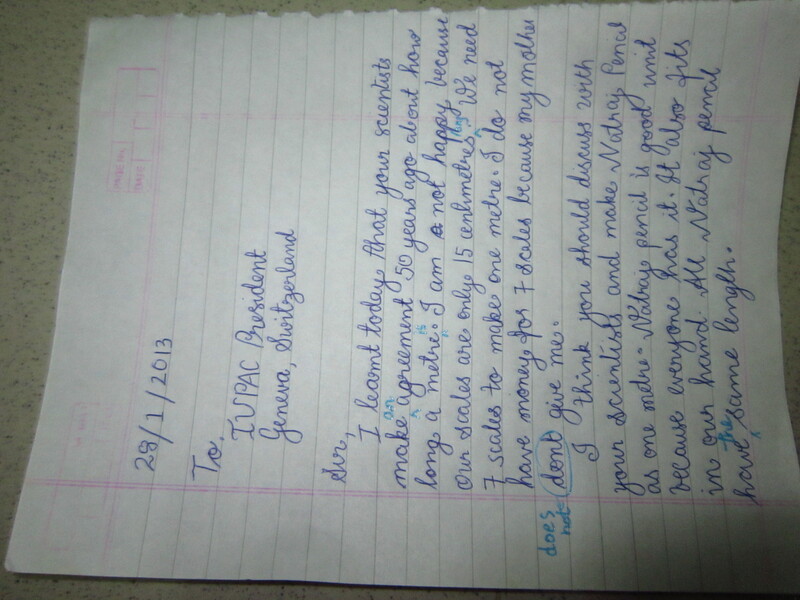 In order to temporarily get over with it, I asked her to write a letter to the IUPAC president if she had any issues with the metre. I thought things would be over and that Mehak would stop pestering me about a trivial issue ( or so I thought) . And as I expected , Mehak did not utter a word after that and was occupied with work throughout the day. 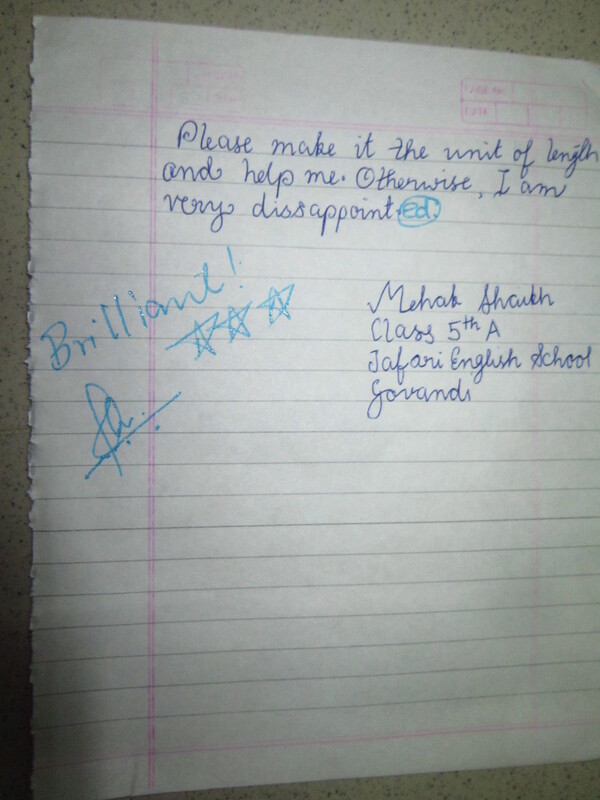 When the school bell rang and students left home, Mehak quietly came to me and handed me a piece of paper. She had actually written a letter to the IUPAC President asking him to change the length of a metre. And wonderfully enough, she also gives an interesting suggestion and backs her suggestion with a very cogent line of reasoning. If the length of the metre annoys her so much, I wonder what would happen if she sees American textbooks filled with archaic units of measurement. Considering she wants to study abroad when she grows up, God save the authors of those textbooks. Be prepared for a barrage of mails from Mehak. I salute both of you, Ashwin & Mehak. Had fun reading the letter. She does make a valid point – why don’t we use some other convenient standard of measurement instead of cold and lonely piece of metal preserved somewhere in the world. I’m not sure how one would go about answering the question but maybe one can start approaching the problem from her point of view itself. When people started measuring things, they chose convenient units of measurement just like her, in terms of “hand” and “foot” etc, just like she chose the pencil. But one needs to remember that lengths defined such, in terms of convenience of your immediate object do not function well when you need to interact with someone who is far away in some distant land and might not use the same objects as you do or have the same kind of body parts. And scientists, fastidious as they are, would really like a standard unit of measurement that is universal and immortal. So, one, you cannot chose an arbitrary object as a standard unit of measurement and expect the rest of the world to follow it and two, whatever it is, it should be accurate enough to help scientists make good measurements. Now, going back to why the standard unit of length is a meter and not 9.1 cm or 3.2 km, it probably has something to do with the length scales at which people liked to think about things. I’m purely speculating here but meter looks like a nice in-betweeny length between the usual hands and foots which people use to measure small objects, and the long distances which people travel. The Wikipedia page on Metre says that one of the first attempts to standardize the unit of length was defining it using second’s pendulum, which probably was one of the easiest experiments that could be performed anywhere and thus approachable to all the scientists who wanted to exchange ideas without worrying about the units of measurement. Anyway, this looks like a great opportunity to illustrate to kids how things work in the outside world and most things that we take for granted have some kind of historical and scientific basis to look for. It’s not random like it might seem. They’ve asked the right question, and now it’s Ashwin’s job to give the right answer. pencil and one scale to measure one metre from your teacher. good student good teacher…. our kids are smart ……. and yes good reply toooo. alright. but one big doubt. IUPAC is for just naming the elements in chemistry. SI units is the one that is responsible for lengths and all. right??? Even I had this doubt in between. So IUPAC is one of the many organisations that are a part of SI. In IUPAC, P stands for Physics. No. It does not. IUPAC is International Union for Pure and Applied Chemistry. Natraj should make this girl their brand ambassador. Totally calls for a 360 degree ad campaign! what an idea little one! And this brought to mind a question that I have had for a long time. How many people would have to agree for a Monday to be declared a Sunday?